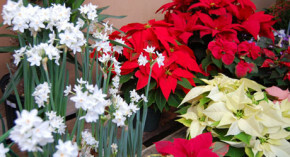 Poinsettias available in discount stores and grocery stores have been trucked cross-country in semi-tractor trailers, subject to temperature variations and dry conditions. And often the only color choice is dull red. 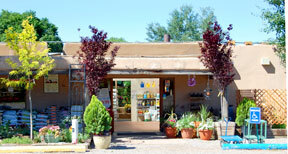 So, for the same reasons it’s important to buy locally grown foods, it’s important to buy locally grown plants. Because Payne’s poinsettias have been growing right here since early July, they are acclimated to Santa Fe’s light and climate. They are hardier, larger, fuller and will last longer. They have been watered, fertilized and pruned so that the colors peak in time for the holidays. They come in a variety of colors from traditional red to pink, ivory, variegated and many more colors and leaf shapes. 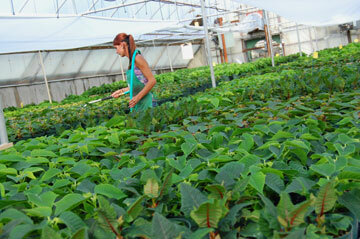 And, obviously, we employ local people to cultivate the plants and they buy local goods and services and pay taxes. It’s a win-win-win situtation: Our customers get the best quality. We generate jobs. Employees patronize local businesses. Gift wrapping and local delivery are available. Click here to see how our poinsettias progress from July to December. Each year we publish a Holiday Brochure — in print and online— which includes poinsettia pricing as well as information on other holiday décor available.